This ICD-10 coding guide identifies the more detailed ICD-10-CM documentation requirements and information vital to successfully implement ICD-10-CM. This collection of best practices provides tools for an effective documentation analysis along with a corrective action plan. An ICD-10-CM documentation how-to guide. Essential charting guidance to support medical necessity. 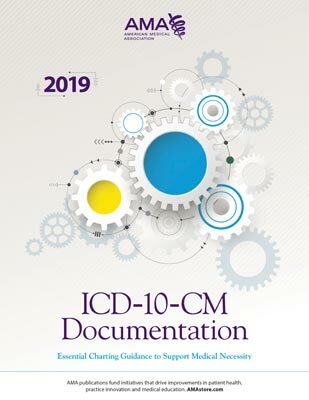 ICD-10-CM Documentation 2019: Essential Charting Guidance to Support Medical Necessity identifies the more detailed ICD-10-CM documentation requirements and information vital to successful ICD-10-CM coding. This collection of best practices provides tools for an effective documentation analysis along with a corrective action plan. ICD-10-CM requires very specific documentation to correctly choose diagnostic codes, a skill that both coders and physicians must master to code successfully. Moving beyond the transition to ICD-10, the new edition focuses on the key role proper documentation plays in supporting medical necessity. ICD-10-CM Documentation 2019 brings coders and physicians together to ensure documentation success, identifying all ICD-10-CM documentation requirements using detailed checklists. Designed for use alongside an ICD-10-CM code book, this comprehensive training guide provides all the tools necessary to conduct an effective documentation analysis and to create a corrective action plan, making it ideal for both non-facility and facility coders. The chapter organization mirrors the structure of code books and all guidance is geared toward the process of code decision-making. In addition, exercises and quizzes test knowledge and understanding of key points throughout the book.